Pune, the most preferable city for Indians has now become a most important city for Education too. In a recent decade, number of pre-schools, kinder gardens and high schools have been derived in Pune since most of the parents prefer Pune as the best destination for their child’s education. There is also an increase in the number of children who stay at hostels of Pune and continue their education right from the young age. Also, Pune has got most important chains of pre-school network that is recognized all over the nation. Thus, let us check top ten important play schools of Pune to lay strong foundation for your kid right from the age of pre-school. ABC Montessori is a successful American Montessori pre-school that is certified with ISO as a non-profitable center. Right from its start on 1994 it has now more than 2000 franchise in the education world. ABC’s way of teaching method is unique with hands on training, heterogeneous learning, self discipline, cultural diversity and so on. Shortly called as “Pre-school specialist”, Euro kids is a famous international play school that has marked its name also in world of children’s book. Euro kids admits children right from the age of 1.8 years and engages them in variety of activities such as singing, dancing and playing outdoor and indoor games and so on. Started in the year 2001, this school is now widely spread across 311 cities in India. This is one of the pre-schools which is known for its high quality teaching. It ensures hygienic environment with clean toilets, pure drinking water and regular health check-ups for the students. This school also conducts regular parents-teacher meeting to give special tips for the parents. This school also encourages the kids to actively participate in stage shows, live dramas and quizzes. It is located at Hadaspar in Pune. This is again a guaranteed chain of pre-schools which was started in 1993 and has its Pune branch at Kalyani Nagar. The brand name of this school let to the success of Billabong High International schools which was later started on 2003. Today, there are more than 100 plus branches of Kangaroo kids play school in more than 30 cities of India. This is a school which concentrates more on self-development and physical education. It offers hygienic snacks on time during lunch hours and makes children to play and engage with other children. Actually started on 1987, it is an NAEYC accredited child development center which also has day care facility. A very famous brand of pre-schools in India is Kidzee and its Pune branch is located at Viman Nagar. This school has several advantages such as training children under the program called “Early childhood learning and development” and teachers are trained and certified through i-Care program. It admits infants right from the age of 1 in their pre-school. It is an initiative of Navneet groups which follows international standards of curriculum such as Multiple intelligence Theory, Mahatma Gandhi’s teachings, Montessori methods and the play way method of teaching. It offers programs such as pre-nursery, nursery, kinder garden 1 and 2 and child care centers. This is one of the oldest pre-schools in India and its Pune branch is located Kondhwa. It assures child safety toys, highest levels of hygienic standards, best transportation facilities and latest teachind methods. Other facilities such as awesome play area which allows children to have fun in parachute riding, yoga, water and sand play, reading and exploration. Curriculum is based on EYFS (Early Years Foundation Stage). It is an excellent school that concentrates on psychological needs of children. This school has been awarded by Education world as “Innovation in pre-school education”. Different programs such as Play group, Nursery, Smart Junior and senior are offered. Also provides excellent play area such as splash pool, sand pit, ball room and activity room. This school which is located at Viman nagar of Pune is a high quality standardized pre-school in India. Curriculum is based on brain based learning that boosts up brain power of children which has been proved successful. 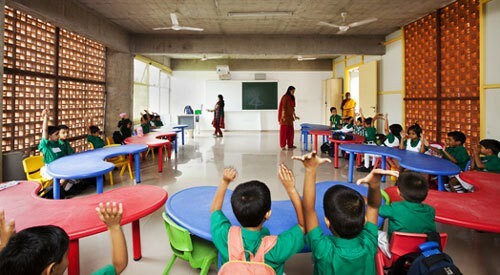 It has several facilities such as child-friendly classrooms, wash rooms, best transport, water games, AV room, and library. It offers special programs such as Homework café, Teacher training course in association with ECDRO and mother toddler programs.